It’s already an open secret that despite being all that well-designed, easy to use, globe-wide famous and virtually an icon on the market, Apple’s iPods are short of some vital features that have been around for seemingly forever on other maker’s offerings. Nevertheless with the help of a pretty much brilliant player and above-average marketing wit, Apple has mostly succeeded in brain-washing vast majority of consumers that built-in microphone or FM-turner are not crucial, let alone such an exotic thing as USB-host. But the company doesn’t have leaving out pretty large-in-numbers group of users, who wish to squeeze maximum out of their gadgets, on its mind. 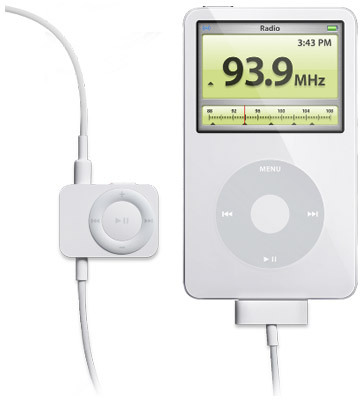 Instead of cheating on its own “just-a-player” concept and trying to get sound recorder, radio and photo archive functionalities on board of an iPod, Apple has enabled third-party developers to manufacture plug-in peripherals and also stuck its own hands into this field, without turning it into a major profit-generator for self, though. 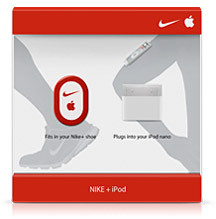 Today’s market of accessories for iPod makes up millions of units (and corresponding sums of dollars), it has its own leaders and outsiders and makes consumers be at a loss for where to look first. Before trying to glance over all handy and the most fetching accessories for the player, let’s make a deal to categorize them by main place of application into three camps, and the most logical titles for these to come up with will be: “on the go”, “at home” and “in car”, on top of that this scheme is followed by some major distributors of iPod and its accessories. 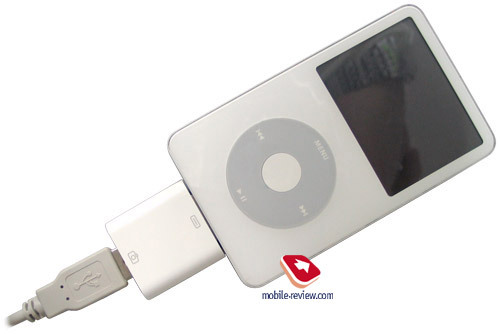 So, the first installment opening up the line of articles on iPod accessories got a somewhat cumbersome name: “iPod ecosystem, part one: on the go”. Naturally “Part two: at home” and “Part three: in car” are coming up soon. Each of the volumes, and this one is no exception, will be offering you a comprehensive close-up on accessories we have managed to get our hands on, in other words, there will be mini-reviews for them along with special notes on gadgets already available on the market yet still missing in our office. Now I have to mention that the market of iPod accessories is literally crowded with manufacturers, ranging from large to small, therefore listing them all is beyond our capabilities – in the next installments we will be highlighting the most interesting products, made as a rule by Apple or the companies at the cutting edge of the industry, while the ones scheduled for release later on will cover solutions delivered by less known manufacturers. Among accessories grouped under “on the go” tag we reckon gadgets designed to be used in tandem with the player outright, which means that they are very portable and do the job not at home or in a car for the most part. A special note goes towards such a huge share of the iPod accessories market as various carrying pouches and casings – the fact is that this topic is so immense that deserves a dedicated review which I hope will come out over at Mobile-Review some time in the future. 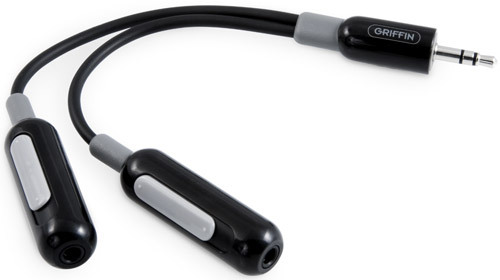 Generally, “on the go” accessories are devices expanding not-so-great default functionality of the player, for example those handling sound recordings or picking up radio signal. Besides, we should also attribute pouches, headphones, snap-out batteries, adapters for linking up digital cameras and memory cards, pedometers and so on. Examples are many, actually – the photos below feature only a scintilla of those. Apple iSock – textile pouches coming in various trims, sold in sets, containing several units. iLuv i603 – snap-out battery in chrome-coated casing merged with a casing. 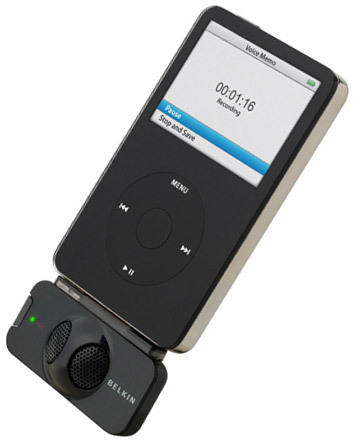 In this installment we will take for closer examination the following devices: TuneTalk, adapter for recording stereo sound from a microphone by Belkin; iPod Radio Remote and iPod Camera Adapter – both made by Apple. 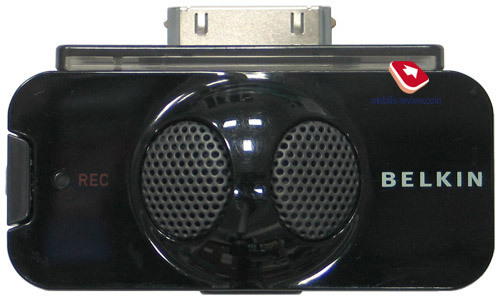 The gadgets is connected to the iPod’s proprietary socket and serves for recording audio from a microphone or line-in – for the former case the device makes use of two built-in mics giving you stereo, while if you come to use the latter method, a line-in is at your disposal, built upon minijack 3.5 mm. TuneTalk squashes its inners into a “yes-it-is-entirely-black” plastic casing, meaning that it will barely get along with a milky iPod, however even if that’s the case, they look not all that bad together. The build quality lives up to what you have come to expect from an iPod mostly because the adapters casing is made up of only two panels plus a stand-alone plate with jacks and autogain switch (read further to find out what it is). To our amusement, TuneTalk’s shell didn’t creak or bend no matter how hard we clenched our fist. Glancing at TuneTalk’s face you see a prominent platform with grill-covered microphone pads on it – I can’t tell for others, but to me they looked more like a fly’s eyes. But it doesn’t put off – on the contrary, with these “eyes” the gadget leaves an impression of professional gear. Next to it is a red LED lightening up while recording and doubling as an indicator of overloads in input signal level. The rear is left completely bald with only device information being engraved on it – the rest of controls are housed by the left side and lower side-plate. Thus, on the left is a bulky Record button with a bulge, which makes locating it blindly a really easy job, but the key lacks some click sensation – at such casing dimensions we would like it to go a bit deeper into the shell on presses. But with its sensible feedback and slight “click” on completed presses leave us no choice but rate its usability as average – it gets the job done but doesn’t put in any remarkable comforts. 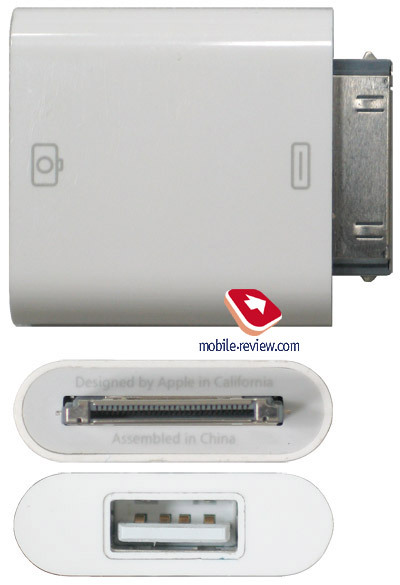 On the lower bottom plate you will find standard USB socket, Autogain switch and 3.5 mm audio jack. These controls should be a subject of a close-up – the USB socket on TuneTalk allows for linking up iPod with a desktop via a standard data cable, which comes in handy especially in trains, when you might just end up having none of special cables in your bag. Running a few steps forward, I can say that for journalists presence of a standard USB slot on this device and being only a few minutes away from trading recordings back and forth without the hassle of iTunes, is something very special. 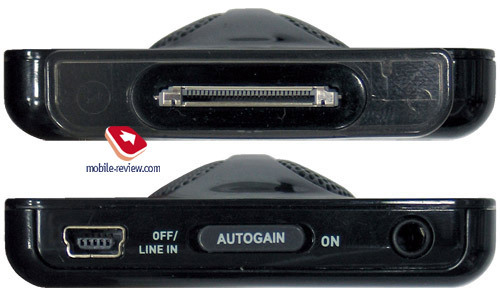 Next to the USB socket is a two-position switch Autogain – toggled to the left it activates the line-in, and while on the right, this switch turns on auto microphone sensitivity adjustment, which makes all the difference when recording sound with the gadget being 6 or more meters away. Finally, we have gotten to the line-in socket – if such necessity arises you can plug in there not a signal source but rather a microphone and thereupon record from it. 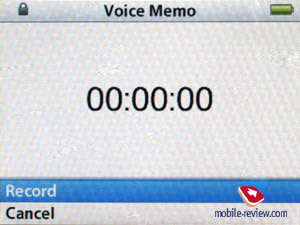 Connected to the player, TuneTalk introduces an additional option into the Extras menu - Voice Memos, containing Quality and Record Now items. From there you will be able to view the list of recorded clips, which can be played back or deleted right away. Unfortunately there are only two quality grades available: high and low with no bitrate or sampling rates settings enabled. Compared to run-off-the-mill built-in microphones, the recording quality achieved with TuneTalk is far ahead – furthermore, I would even take the risks of placing it on top of that provided by digital voice recorders residing in the mid price-bracket. However it should not shock you or surprise greatly, the reasons why it is so are on the surface: two independent omnidirectional microphones on the gadget’s face lifted on a special platform. Moreover, recorded signal doesn’t get converted into MP3 outright – on the contrary, you are getting WAV with some whooping specs – 44 kHz, 16 bits, 1441 Kbit/s for high quality, 22 kHz, 16 bits, 352 Kbit/s for low. 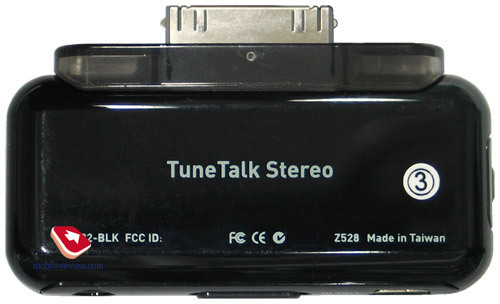 In course of our quality time with it, TuneTalk put up pretty good results – a special credit goes to the auto microphone sensitivity adjustment feature, autogain – with this activated, the gadget seamlessly made out the voice coming from round the corner 10 meters away interfered by noise (playing audio system). These tricks, as far as I remember, haven’t been up any player’s sleeve, thus I’m even having a hunger for getting TuneTalk to record interviews we occasionally get to take with the help of our iPod Video. 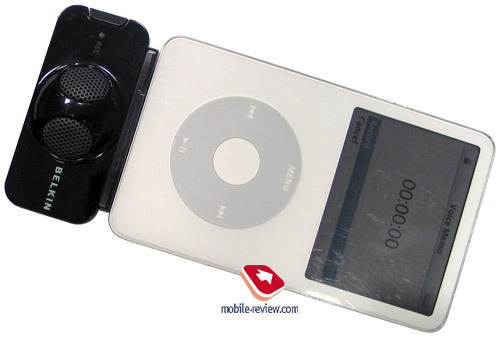 Apart from that, with this gadget on hands you can record podcasts anytime and anywhere and in any desirable manner – LIVE reports are not a problem with it. At any rate, the device has its own letdowns, even though they are minor. First of them is battery life – no wonder that on connection TuneTalk starts draining out energy from the player, so recording 30 Gb of audio is not possible firstly because the battery isn’t capable of keep the system up and running for this long. Despite the gadget having two microphones, accurate separation of channels cannot be reached with TuneTalk – we tried to flank it with point sound sources and still couldn’t get what we wanted, the signal seemed to be mixed within the device itself. 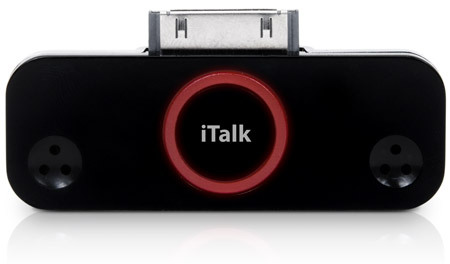 On top of that be ware of linking up iPod with an iTunes-equipped desktop via TuneTalk- all clips stored in Recordings folder will mysteriously go missing. 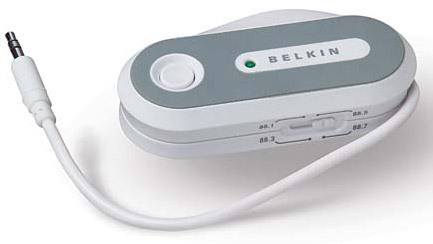 Otherwise Belkin TuneTalk does extremely well and turns an iPod into at least a semi-professional tool for recording sound, but the price is what everything comes down to – 70 USD in the US and about 85 USD in Russia plus out-of-stock status that always hangs around (at present it can’t be ordered even at the maker’s official page due to being “in popular demand”). 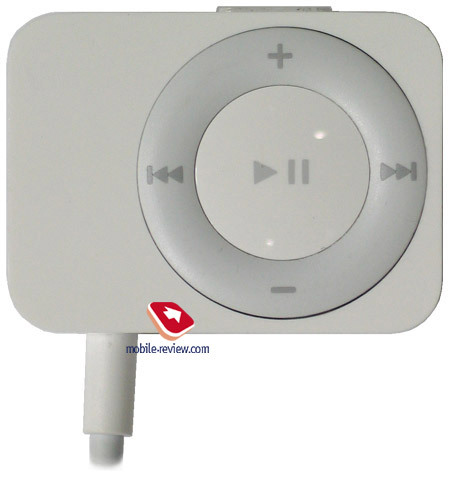 At a glance Apple Radio Remote is almost a replica of iPod Shuffle 2G – apparently, it served as the preimage for the actual player, as it features a clip, navigation circle adopted from the first generation Shuffle. 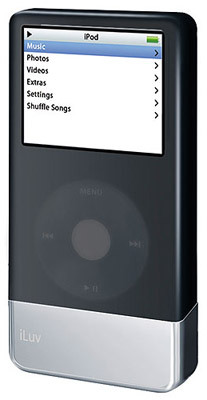 The gadget is meant for wireless control of playback and other features of the player and also packs a FM-tuner, making up for the omission in original iPod’s functionality. 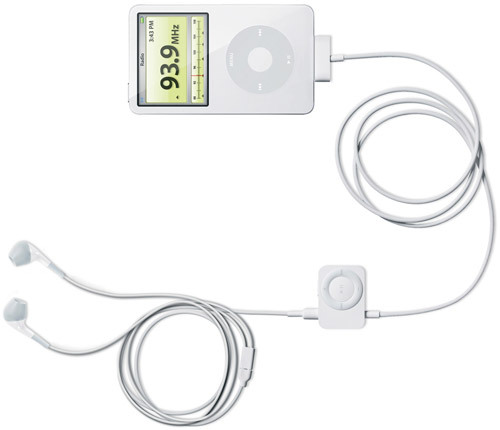 Design wise, Radio Remote is a rectangular block with firmly fixed about 1 meter long cable with a proprietary plug for iPod socket placed on its end. 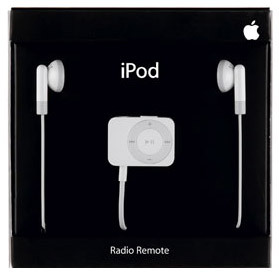 The block itself is equipped with a metal clip (while the casing itself is made of plastic) and standard audio jack suitable for headphones the Radio Remote comes boxed with – in fact they are no different from default iPod earphones, yet the cable is shorter. As for me, it would make more sense to include into the Radio Remote package Apple In-Ear Headphones are just leave it all alone in the box, since any iPod comes bundled with the same unit having longer cord, and if you come to think of this, paying a premium for such questionable advantage (maybe) is not an option even for the most zealous fan of Apple. The build quality deserves some warm words and is on a par with that found on iPod Shuffle, fortunately the casing has no panels or seams, except for the place where the metal clip is attached to the casing. On connection to the player, its main menu will immediately get extended with Radio option – picking this item will start up radio mode and sets up its theme onto the display, which is quite good-looking with large digits and letters, however the question still is, why this wallpaper looks so different from Apple’s default style which would be much more fitting here? Not only does reception quality for Radio Remote, which is the most vital parameter it should be judged by, live up to the expectations, it proves to be a head above expected figures in some ways. All radio stations in Moscow we managed to pick up were received in a solid way – no noises or interferences – meaning that it will always be a pleasure for you to listen to them be it at home or in the office. Availability of default RDS support enables us to conclude that the “heart” of Radio Remote is a new chipset by Philips or some other manufacturer rather than the standard unit known as NXP (Philips) TEA5767, with this feature missing onboard. Stable reception, cutting-edge chip – what else could we want? The blot on Apple Radio Remote’s landscape was surprisingly unique: using this gadget we couldn’t pick up some stations within the frequency range, and the reason lied in the fact that frequency may be set up only at a pitch of 0.2 mHz, in other words 104.9 goes up to 105.1, then – 105.3. In a nutshell you lose the ability to tune in 105.2 precisely. This very issue seems to me at least strange and if you are aware of a way to solve it – go ahead and share it with us please, as I have already given a try to all methods I could only come up with. Addition: our reader, Eugene Kalinovskii was the first one to present us with the solution – getting a pitch of 0.1 mHz is possible, though in return you will have to give up RDS signals reception. On connection of Radio Remote to iPod there will be a new option in Settings menu, specifically frequency range adjustment (which I overlooked in the first place). To put it simply, you can pick European, Japanese, American, Australian or Asian frequency range; going for the European option will bring about that pitch of 0.1 mHz, regrettably should you do so, the display will no longer feature RDS info. With the American range turned on, RDS comes back to life, but then again you will have to put up with being unable to tune in “even” radio stations. From my point of view, Apple Radio Remote could be one of the top items on your to-buy list if only it lacked strange pitch and “superfluous” headphones. But at any rate, these disappointing omissions are not a real impediment for radio addicts (though, only in case their favorite radio stations don’t have “even” frequencies), ready to take out about 65 USD from their pocket and 50 USD more to get good headphones. The device materializing the philosophy of a perfect accessory, boosting a gadget with some features: small, unsophisticated, lacks controls and any kind of settings. In fact Apple Camera Adapter serves for turning iPods from Jukeboxes into a pretty good soft of portable photo archive, especially in light of the growing storage space, which now make up to 80 Gb in volume. 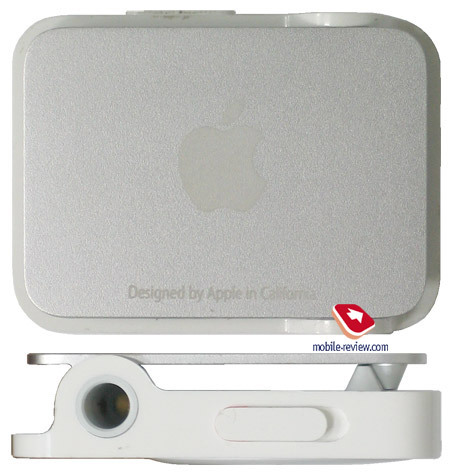 The design of the Camera adapter is exceedingly simple: a plastic casing rectangular in shape with smoothened edges has an iPod plug on one side, and a standard USB socket on the opposite plate. 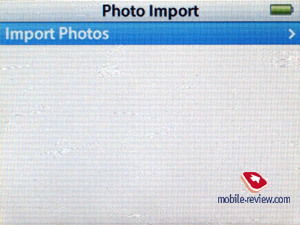 A digital camera gets linked up via USB data cable to Camera Adapted, and, consequentially, to the connected iPod, which altogether brings a new item onto Photos menu - Sync Photos. Choosing it copies all snaps from your digital camera’s memory to iPod’s hard drive, thus after doing all this you can wipe the camera’s storage and go on with shooting. We can’t turn a blind eye to relatively slow data transfer speed, making up about 1 Mb/s, however it is not a serious flaw at all – only a few gadgets today have host USB 2.0 bundled. Using the Adapter is as simple as it only could be – it has tiny dimensions and won’t be a burden whatever the case is. 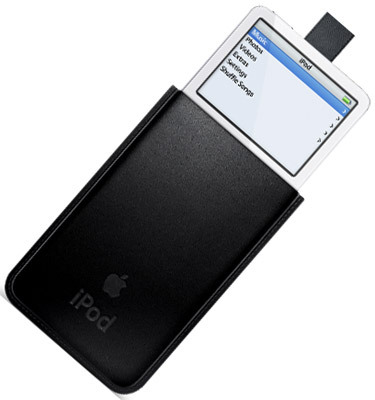 The claimed functionality is not a problem for it, while utilizing it for different purposes is impossible – getting files onto iPod from a flash drive is prohibited. Apparently, the iPod plug-in peripherals do the job much better than their counterparts built in players made by other brands. At that, however, they do stretch your pocket and add more bulk to the player; nothing can be done about that. 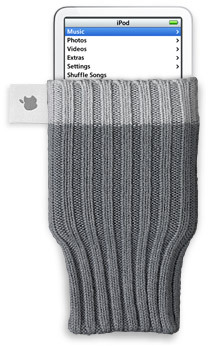 It seems that Apple has the following on its mind: users who have come to realize how badly they need this or that functionality missing on feature-unfriendly default iPod, will buy accessories and thus generate some direct or indirect profit for the company. That is why hoping that Apple will finally arm its upcoming players with new features is too naive. On the other hand, iPod plays the central part in an ensemble that can be built up by yourself by purchasing various accessories – from leather casings to FM-car-receiver – and eventually you will get the most out of the player. Whether or no, the competition between “full-fledged” and “so-so” solutions plays into consumers’ hands, which at the end of the day is always good - wide variety of gadgets never does any harm.